You are here: Home / Periodontal Therapy / What Are the Telltale Signs of Gum Disease? Gum disease is a silent enemy. Most of the time, you won’t see symptoms until the disease is already in the advanced stages. You can tell if the gums are healthy by taking a good look at them. If your gums are pink and firm, then you have healthy gums, but if your gums are often bleeding during or after brushing,then that isn’t a very good sign. A great way to check the health of your gums is through a periodontal evaluation at the dentist. The dentist will check for signs of gum disease and any potential threats to your oral health. Leading periodontal therapy expert, Dr. Jeffery Ballard, discusses the early and advanced symptoms of gum disease. Watch out for red, swollen gums as they are signs of gum problems. The gums become inflamed with high levels of bacteria inside the mouth. You may think that this is normal, but it’s not. Bleeding gums are a sign of gum disease; hence, a dental visit is a must when you experience this symptom. If you notice your teeth appearing longer than usual or if your gums seem to have pulled away from your teeth, then you are already experiencing gum recession. Scientifically known as halitosis, bad breath is an indication of gum disease in its advanced stage. The stench remains even after you’ve brushed or flossed your teeth. This type of bad breath can’t be covered up. The only way to remedy the situation is to take periodontal therapy. This is a clear indication that you have gum problems. In this case, the gums are not fit to hold the teeth in place; therefore, they loosen up or shift position. Gum abscesses are pockets of pus that you will find between your gums or teeth – another clear indication of gum disease. The formation of pus means that infection has already settled inside your gums. This kind of infection will only go away if you take periodontal therapy. Do you notice something different with your sense of taste? If so, gum disease may already be present in your mouth. Since gum disease can alter the position of the teeth, it can affect your bite and the way your teeth fit together. If your dentures suddenly become ill-fitted, then chances are high that you’ve acquired gum disease. A great way to remedy the situation is to visit your dentist, get periodontal therapy and have your dentures readjusted. Good oral care coupled with regular dental visits is a great way to prevent gum disease. 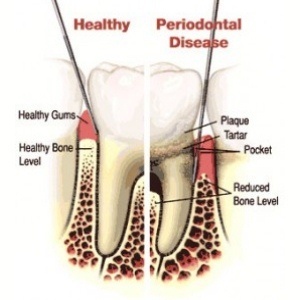 However, if you are already experiencing gum problems, the best thing to do is to take periodontal therapy. The dentist will perform a thorough cleaning of your teeth and gums and then recommend treatments to remedy your situation. For quality periodontal care in Atlanta, GA, visit us, at Buckhead Dental Partners. Trust Dr. Jeffery Ballard to take care of your teeth and gums, so that you achieve optimum oral health. Call us today at (404)261-0610.